Childhood can be a cruel torture: As a result of feeling abandoned, the young victim is pushed to build A fantastic world, in which he’s got the chance of being the sovereign and create the rules. This is the story of one of them, who pretended to be a writer. Nonetheless, his dark side grew up much more tan his ability of getting the success. “The Pillowman” leads us to a place full of sickness and irony where we can only have one response to the most menacing fear: Would it be possible to treat the family scars? On his play, Martin McDonagh forces to live together throughout a never-ending day an author specialised in morbid tales about suffering children constantly hurt by wicked adults, his disabled brother and the two detectives in charged of researching a twisted killer inspired by the astonished storyteller’s works. O’Kelly, Jeffries and Giblin won’t sleep together. Jocular Theatre has brought this ambiguous dramatics to Barcelona and its members have been performing for some days at Antic Teatre, the non-stop experimental laboratory in all kinds of cultural arts. Directed by an enthusiastic Joshua Zamrycki, the cast seems to be very focus on combining the realistic points (the capture in a prison of the two relatives linked for all the times, their way of defending themselves from the authorities’ impatience) and the fictitious moments (such as the presentation of the different tales and even the ancient memories from the main characters) but the results are not well balanced: We notice that the actors have some difficulties at the time of recreating too extended dialogues, the ones that cover the emotion. Contrary to it, the imaginary situations are convincing and promising because of an attractive mixture of horror and black humour, apart from the accurate symbolic conception of the body language. However, that version includes Ben Torbush’s touching acting as a fragile creature causing the pity of the audience, surrounded by James Giblin’s charisma, the rudeness of Billy Jeffries and the witty of David O’Kelly. A handful of rough violent scenes well designed, and a sggestive weird plot as well: What is the real important in literature? Does it consist of a way of controling the listeners’minds or maybe it is the only therapy for a traumatized narrator? 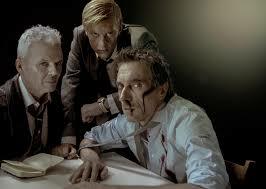 “The Pillowman” was performed at Antic Teatre of Barcelona from the 26th. november to the 1st. of december.